Perfume Pretty Barbie advert from 1988. Ruth Handler watched her daughter Barbara at play with paper dolls, and noticed that she often enjoyed giving them adult roles. At the time, most children’s toy dolls were representations of infants. Realizing that there could be a gap in the market, Handler suggested the idea of an adult-bodied doll to her husband Elliot, a co-founder of the Mattel toy company. He was unenthusiastic about the idea, as were Mattel’s directors. During a trip to Europe in 1956 with her children Barbara and Kenneth, Ruth Handler came across a German toy doll called Bild Lilli. The adult-figured doll was exactly what Handler had in mind, so she purchased three of them. She gave one to her daughter and took the others back to Mattel. The Lilli doll was based on a popular character appearing in a comic strip drawn by Reinhard Beuthin for the newspaper Die Bild-Zeitung. Lilli was a working girl who knew what she wanted and was not above using men to get it. The Lilli doll was first sold in Germany in 1955, and although it was initially sold to adults, it became popular with children who enjoyed dressing her up in outfits that were available separately. Upon her return to the United States, Handler reworked the design of the doll (with help from engineer Jack Ryan) and the doll was given a new name, Barbie, after Handler’s daughter Barbara. The doll made its debut at the American International Toy Fair in New York on March 9, 1959. 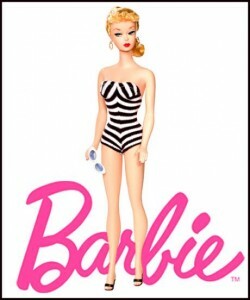 This date is also used as Barbie’s official birthday.